Anna was never anything like those ‘real’ runners on telly – all spindly limbs, tiny shorts and split times – but when she read about New Zealand’s 3,000-kilometre-long Te Araroa Trail, she began to wonder… perhaps being a ‘real’ runner was overrated. Maybe she could just run it anyway? Travelling alone through New Zealand’s backcountry for 148 days, she scrambled through forests, along ridge-lines, over mountain passes, along beaches and across swollen rivers. Running up to 52 kilometres in a day, she slept wild most nights, and was taken into the homes and hearts of the kiwi people in between. 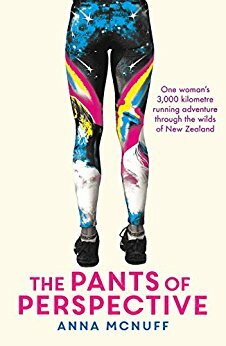 The Pants of Perspective is a witty, colourful and at times painfully raw account of a journey to the edge of what a woman believes herself to be capable of. It is a coming-of-age story which will lead you on a roller coaster ride through fear, vulnerability, courage and failure. For anyone who has ever dreamt of taking on a great challenge, but felt too afraid to begin – this story is for you. Back in the summer of 2017 I decided to explore the trails of the world vicariously. Whilst basking in the Florida sunshine I traversed the Appalachian Trail with Bill Bryson in A Walk in the Woods, joined Cheryl Strayed on her voyage of self-discovery along the Pacific Crest Trail in Wild, and finally I took to New Zealand’s Te Araroa Trail with adventurer and “mischief maker” Anna McNuff in her book The Pants of Perspective. I first came across Anna McNuff when she was interviewed on the Tough Girl Podcast. I was drawn to her sense of fun and adventure, the way she wanted to speak to school children and inspire them to go after their dreams, so when I saw that she had written a book about her New Zealand adventure, I was quick to grab a copy and devour it straight away. And I certainly want disappointed. Anna (it somehow feels right to use her first name rather than be all correct and write”McNuff”) is such an engaging writer. I mean, even from the title and cover art we can tell that she is going to have a sense of humour. There are certainly times when the going is tough, but we are rooting for Anna all the more because her warmth and enthusiasm come through on every page, fostering a connection with her. Reading the book almost feels like a catch up with a good friend. We join Anna as she undertakes a 148 day run from Bluff, at the southernmost tip of New Zealand, to the lighthouse at Cape Reinga, 3000km away in the north. Yet this is not really a book about running, per se. For me, it’s more a book about the journey (both literal and metaphorical) that Anna undertakes and the unforgettable “trail family” she creates along the way. Despite her taking on what feels like an overwhelming challenge, Anna is very “real” and somehow makes the whole thing seem so much more accessible. We are shown that even with some oversights in planning, taking on an adventure like this is possible and through the cast of characters she bonds with along the way, we are reminded of the inherent good in people when complete strangers look out for each other and provide support. Yet Anna also lays bare some of the low moments, the times when it is a struggle to keep putting one foot in front of the other because she’s exhausted, or hurt, or the weather is awful (or all three!). We are inspired by her mental strength and fortitude when fear takes hold, and we celebrate her successes along with her. At times I almost wished I was there, sharing a slice of cake (there’s quite a lot of cake/chocolate consumption) before hitting the trail once more in a pair of ludicrous leggings. “Setting my empty coffee cup down beside me, I rummaged around in my bag until my fingers found what I was looking for. Pulling out the mess of brightly coloured Lycra material, I laid it flat so I could see the entire pattern. Moments earlier, over another morning’s serving of cold porridge, I had remembered something. I’d thought in spending over five months on the trail that perhaps, just perhaps, I was going to have one or two days when I didn’t want to get out of my tent and run, and instead I might just want to curl up in a ball and cry. For this situation, I had packed myself a secret weapon – a pair of magic Lycra pants. I loved this idea, and as someone with a penchant for more “unusual” leggings, the discovery that I could buy my very own pair of THE pants via Anna’s website was fantastic. Yes, I did buy them (and got a very lovely email from the lady herself as part of the process!). As such, I can confirm that Anna’s right – you really can’t be miserable whilst wearing these beauties! If you haven’t already read this book then I highly recommend it. Not only is Anna easy to relate to and engage with, but she is also a very good writer. Sometimes books about adventures can have a “detached” feel about them, or they read a bit like a series of notes. But not this one. This one takes you along on the journey (whether you have the pants or not!) and leaves you feeling like you’ve made a new friend. I believe Anna has been writing a new book about one of her other adventures and I, for one, can’t wait to read it. You can find out more about Anna McNuff here. You can watch Anna’s TED talk here. Quite frankly, I loved this book. In recent times I’ve become captivated by the fortunes of Jo Pavey, particularly in her quest to qualify for the Rio Olympics, so when I saw that her book was suggested for The Runner Beans Book Club I was thrilled as it gave me just the excuse I needed to order a copy and get stuck in. The book begins fairly recently with Pavey’s race at the 2014 National Championships – dubbed the ‘Night of the 10,000m PBs’ – which was a trial for the European Championships in Zurich that summer. I enjoyed this as an opener for the book as it set the tone perfectly – Pavey juggling her running around being a mum (and the occasional spanner in the works thanks to family life!). What follows is a history of Pavey’s running career, from her earliest days with Exeter Harriers, right through to winning gold at the European Championships in 2014. Throughout the book Pavey comes across as down to earth and humble, but perhaps what resonated the most with me is that her career has not been straightforward. Pavey has battled through injury and on many occasions has wondered if she could ever truly demonstrate her potential. That certainly sounds familiar to me! And interestingly, her greatest successes came from taking a more unconventional approach to training such as when she and her husband took time out to go travelling or, as a new mum, fitting training in around the needs of her children. Perhaps something for us all to consider when we’re obsessing over our latest training plan! She also writes very humbly about the mass participation nature of running, offering advice for those who might want to take up running for the first time and writing of how privileged she feels to be part of a sport where the elite and the amateur can line up together. She heralds parkrun as a great weekly event (I definitely agree with her there!) and mentions her enjoyment of the camaraderie of running, the family-friendly environment and the experiences that have enriched her life. Reading this book feels like a chat with a friend, and I think that’s why I enjoyed it so much. Resilience. Despite being plagued by injury, she never gave up. There may have been disappointments along the way, but Pavey bounced back and focused on what she could do to improve her running for the next race. Determination. Whatever she set her sights on, she did everything she could to make it happen. Even when injured Pavey continued to train in any way she could, whether through pool running, strength training or running on different surfaces. She was prepared to travel great distances for the facilities she needed and wouldn’t let anything stand in her way. Learn from experience. Albert Einstein reportedly said, “the definition of insanity is doing the same thing over and over again, but expecting different results.” Pavey and her husband Gav (who is also her coach) use the knowledge and experience they have gained over the years to know what works best for her training. Although she says she wishes they’d known some of this when she was younger, I guess there’s sometimes nothing for it but to learn things the hard way, make the training mistakes and come out the other side stronger. Age is just a number. Yes it’s a cliché and Pavey acknowledges it as such, but it’s certainly true for her. Pavey may now be considered an “older” runner (in fact she jokes that since turning 40 she may as well have a double-barrelled surname as she is always referred to as “Jo Pavey-forty” in the media!) but she is still running phenomenal times, with some of her greatest performances taking place over the past few years. She is a little older than me (although I’m catching up rapidly!) and the older I get the more I thrill to see Pavey showing the world that “older” female athletes can still give the next generation a run for their money (pun intended). Find balance. It is since having her children that Pavey seems to have found the key to successful training for her. By training whatever way she can around the needs of her family, and feeling much more relaxed than previously going into competitions, she has been able to perform really well. In addition, she has been much better at listening to her body and prioritising rest, as she knows she needs to conserve enough energy to run around after her children. It’s clear that family life is important to Pavey – indeed the title of the book This Mum Runs prioritises her kids over her running – and that seems to have unlocked fantastic potential. Whether you have family or not, there is always a balance to be sought between work, training and life in general. It’s something I’ve been working hard to find as well. Of course there are darker moments in the book, and I don’t mean the sections describing the disappointment of injury. Pavey devotes a chapter to the doping scandal that broke late in 2015 and we see the heartache caused to those who missed out on medals due to the cheating of others. It’s not just about the loss of a podium finish, but everything that goes with that: the disappointment and anger at missing out on a victory lap, of a moment in the spotlight; the impact on an athlete’s confidence as they struggle to comprehend how they can match up to others putting in phenomenal performances; the risks they may take in training in order to “catch up” to others. Since publication of the book Pavey has called for those who have since been awarded medals that were robbed of through cheating to be given the opportunity to have the ceremony they missed out on at the time, something that is now going ahead at the World Championships in London this month. Reading this book was a really enjoyable experience for me and it was great to find out more about an athlete I’ve come to admire greatly. If you think being an elite athlete is easy, then I encourage you to read this book and see that the “elites” are really just like the rest of us. Because in business it doesn’t matter what you do, it matters why you do it. This book is for anyone who wants to inspire others or to be inspired. If I’m honest, this is not normally the sort of book I would choose. It’s largely aimed at a business market – from the big multi-national to the small one-person enterprise – and I feel like my working life operates in a rather different way. But that doesn’t mean there aren’t valuable lessons for me to learn from this book, so when Steve selected it as “a book chosen for you by your spouse” as part of my reading challenge last year, I was interested to see what I would get from it as it’s a book he returns to again and again, recommending it to anyone and everyone! Using Apple as an example, Sinek explains that every single company in the world knows WHAT, they do, some explain HOW they do it (usually by giving information about their USP), but very few clearly explain WHY they do what they do. Yet it’s the WHY that people buy into. If our beliefs are the same as those of the company, we will buy their products even if they are not necessarily the “best” on the market by other measures. WHY is about building trust, sharing values and stimulating emotions rather than simply appealing to the logic centres of our brains. When the WHY is clear, loyalty grows; when we lose sight of our WHY and focus instead on WHAT, failure is more likely. Throughout the book Sinek charts this through examples of success, failure and comeback, linking each closely to how firm a grasp a company or leader has of their WHY. So what can I take from this either in my working life or as a runner? In teaching, I need to have a clear sense of WHY: why am I teaching this topic? Why am I taking this approach? Why is this pupil not meeting their potential? and so on. Young people frequently ask WHY, they need to understand the reasoning behind what they are being asked to do, particularly if it is a task they find challenging. If I lose sight of WHY, then learning and teaching in my classroom will suffer. Sinek also devotes a chapter of the book to trust, something which I consider important in my classroom in order to build positive relationships and make behaviour management easier. Teachers are leaders of learning, and leading means creating an environment where others willingly follow (as opposed to being a leader which is the status of holding the highest rank). How can I possibly get a room full of teenagers to follow my instructions and advice if the trust is not there? My pupils, like everyone else, base their trust on the sense that someone else is driven by something more than their own self gain. If the WHY is clear, the trust emerges and hard work happens. And this is also true in running. It’s all very well to go for a run, sign up for a race or set a goal; knowing WHY these hold importance leads to a much more positive experience. WHY could be the difference between positive training and junk miles, between racing for the sake of it and targeting an event, between meeting a goal and sitting on the injury bench. Sinek’s clear message is that if you don’t know WHY then you can’t know HOW. That make sense to me: it’s all very well knowing WHAT my goal is, but knowing WHY it’s my goal gives me the added motivation to overtake it. If I know WHY then I can work out HOW to make it possible – the workouts I need to do, the paces I need to hit, the timing of events, etc. Knowing my WHY will lead to great success than simply knowing WHAT. WHY is also important in thinking about those we surround ourselves with. We have evolved to form groups, or cultures, who come together in a shared set of values or beliefs, that’s why in times of great debate we don’t always see both sides of that debate reflected in our social media feeds as those we follow tend to believe what we believe. In business, this means employing people who share your WHY and will be inspired to be productive. In running and other sports this means surrounding ourselves with people who will be positive and encouraging. When I picked up an injury in training for my first marathon, I lost count of the number of people who told me it would be impossible to complete the race on the mileage I had completed, but I chose to listen to those closest to me who believed it was possible and adapted my training because I was clear on WHY I wanted to achieve this goal. The result? I completed the race and got the marathon bug! These days I prefer to train alone, but I still find those who share my values and beliefs through social media. WHY is the reason I believe so strongly in the message of Sarah Williams of Tough Girl Challenges. She wants to motivate and inspire women and girls by sharing stories of women taking on incredible challenges, fighting through adversity and achieving amazing things. I became a member of her closed Facebook group the Tough Girl Tribe because I saw the opportunity to connect with other women who share my WHY. I may never meet many of those women, but I know they are joined through a culture of support, encouragement and positive belief. Our WHYs are in line with each other and that will help us all to succeed in whatever personal challenges we set. You can read a useful summary of Start With Why here (although I would really recommend reading the whole book). Book Review – Your Pace or Mine? One of my goals for 2017 is to read at least 30 books (an extension of last year’s goal to read more books, which evolved into a goal on Goodreads of 15 books in the year) so when I saw that Charlie Watson aka The Runner Beans had suggested an online book club, I jumped at the chance to be involved. What a brilliant opportunity to read some great books, share my thoughts and connect with others. After a vote (which I found a bit tricky as I wanted to read just about all of the choices!) the first book was chosen as Lisa Jackson’s Your Pace or Mine?. I knew about this book as Jackson is a contributing editor to Women’s Running and I also listened to her on a recent episode of the Running Comentary podcast, so I had an idea of what to expect. What I enjoyed about this book is that Jackson highlights the sense of community among runners. She’s not an elite who was running fast times practically from birth, she’s a “real” and inspirational runner who found running a bit later in life (as did I, indeed I was a similar age to Jackson when I ran my first marathon) and who prides herself not on her finishing times, but on how good a time she has at each event she goes to. And that makes a world of difference. Jackson’s trademark is to run each marathon is some kind of fancy dress or crazy headgear, and while there will be an elitist few who might turn their nose up at her “chat-run” approach, there’s no taking away from the fact that she IS a member of the 100 marathon club, she HAS run Comrades (more than once) and she HAS run the Boston marathon. How many of us can say the same? The over-arching message is that you don’t have to be fast to run a marathon, you just have to be prepared to give it a go. Throughout the opening chapters we learn more about Jackson and the supporting cast of characters around her. We learn of her triumphs and setbacks. Most importantly, we learn about the amazing people she has met along the way. As a confirmed “chat-runner” (her term for it) Jackson has come into contact with all manner of people, all taking on the same quest as her – to cross that finish line and have an experience that will change their life. She has picked people up in their toughest moments and kept them company to the finish, dished out chocolate to keep spirits up and laughed her way to many a finish line, sometimes long after the official cut off which doesn’t bother her at all. She’s even run naked (and for once I don’t mean leaving her watch at home!). Each of these chapters also finishes with stories from the runners she has met along the way, and while inspiring, this is probably my only issue with the book. Don’t get me wrong, I enjoyed reading what these people had to say, but I felt that it interrupted the narrative of Jackson’s running journey. I think I would have much preferred that these were collated as a chapter of their own or an appendix at the end so that I could read them AFTER I had read everything Jackson had to share. Given Jackson’s conversational, community-focused approach there is definitely a place for these stories, I would just have liked them organised differently. But perhaps that’s just me. And what can Jackson teach us about running? Actually quite a lot. For the beginner, the debunking of many a common running myth that may halt running dreams in their tracks before they really get started. For the more experienced, a reminder that there’s so much more to running a marathon than how long it took us, that time only tells part of the story. And as I discovered on my “tourist run” of the Paris marathon last year, sometimes taking your time and soaking up the atmosphere leads to a far more memorable experience than pushing yourself to the limit in your quest for a specific time. For all of us, Jackson provides the inspiration to never give up, to pursue our dreams no matter how ridiculous they might sound to others. If we can dream it, we can do it. This was also a book peppered with comedy moments, from Jackson’s stories of mid-race mishaps to the list of T-shirt slogans that have made her smile. I may not have taken quite the same approach as Ms Jackson to my running, but I know the experiences and memories I have make my running story all the richer. Jackson clearly revels in being part of a running community, and the affection the runners she has met hold for her is clear. Running can be a solitary pursuit, especially if, like me, you train alone, so feeling like part of a community though my blog, social media groups and good old parkrun are really important to me, and when I think of it like that I can understand why Jackson takes the approach she does. Overall I really enjoyed this book (slight bugbear about the arrangement of the stories from others aside). It was an easy read and I felt a connection with Jackson through her conversational style (hardly a surprise for a writer who is also a chat-runner!). I could relate to so much that she wrote, particularly about starting out and refusing to give up, messages I’m always keen to promote to my pupils. So if you have any interest at all in running and are looking for an easy read for these dark January evenings, then Your Pace or Mine? might be just what you’re looking for. This is a celebration of running – and what lots of us think about when we run. Part escape, part self-discovery, part therapy, part fitness. Part simple childlike joy of running when you could be walking. Each of the 26.2 chapters also features a fascinating insight into how others first started – from Paula Radcliffe to Steve Cram, the Brownlees to Jenson Button, Nicky Campbell to Nell McAndrew. Vassos Alexander is one of those guys you think you know, even though you don’t. Those of us who listen to the BBC Radio 2 Breakfast Show are accustomed to his dulcet tones delivering all the latest news from the world of sport every weekday morning, and we’ve come to learn that running crazy distances is a big part of his life. So when I heard that Vassos (I know form dictates that as an author I should refer to him as “Alexander”, but on the radio he’s always just “Vassos”. I hope he’ll forgive me!) was writing a book, I knew I would want to read it. The book, Don’t Stop Me Now, was published in late March of this year, and my chance to sit down and devour it came on my recent summer holiday. I downloaded it to my Kindle before I left, and got myself settled on my sun lounger to read it almost immediately. And I had it finished in a couple of sittings! 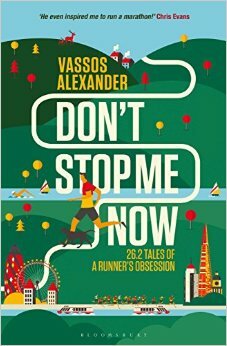 What I liked about this book was that despite the fact that Vassos has completed iron distance triathlons and ultra-marathons, as well as having access to famous faces from sport, his book is still relatable: Vassos only took up running in his mid-30s after realising he was beginning to gain weight, and some of the struggles and worries he writes about are familiar to us all such as going for that first agonising run and being seen by the neighbours, or the start-line nerves of a first race. Yet through it all, his love of the sport shines through and we see him progress from the notion that having all the latest kit and gadgets would make him a better runner, to the revelation that running can be a much more simple and enjoyable experience. “In the end, as I prepared for my run wearing every conceivable bit of kit and waiting aimlessly for my extravagant watch to find a signal, I would secretly be dreading the hour or so that lay ahead of me. A fantastic attitude, and something we should all remember every time we lace up our trainers. It’s the lesson Vassos has learned on his running journey and is passing on to the next generation. It’s what running should be all about. Overall, this book made me laugh, made me cringe and made me nod in agreement. It’s a book about running, written by a runner, for runners, yet you don’t have to be an iron distance triathlete or sub-3 hour marathoner to enjoy it. If you’ve ever bought a pair of running shoes, then you’ll probably enjoy this book. It’s easy to dip into and made for the perfect sun lounger read at the start of my summer holiday. If you’re looking for a running book to read, then I recommend this one. For Anna, a cycling enthusiast, the decision to ride 4,000 miles solo around the coast of the UK wasn’t that hard. But after epic highs, incredible lows, unforgettable scenery and unpronounceable place names, her simple idea turns into a compelling journey of self-discovery, and an eye-opening insight into what makes the island where she lives so special. And so as I spun the pedals of that bike, I was able to ignore the digital readout in front of me and rather than watching the time crawl by painfully slowly, I imagined myself cycling along with Anna Hughes as she embarked on her challenge of cycling around the coast of Britain. It was a trip that took 72 days and Hughes documents something from every day, from the pitfalls of bike maintenance to the pleasure of fish and chips by the coast, with a cast of interesting characters joining her at various points along the way. The book itself is divided into 5 parts, mirroring 5 sections of the journey: the east coast of England (11 days), eastern Scotland (12 days), the Highlands & Islands (13 days), north west England (18 days) and southern England (18 days), starting and finishing on Tower Bridge in London. The journey would take her 4000 miles around the coast and she would learn a great deal about herself along the way. I was struck immediately by how Hughes was not going to make every moment sound idyllic. Even on the first day, when the excitement of departure waned and Hughes found herself 7 hours later feeling hot and grimy, but barely even 50 miles in. She was exhausted, her spirits were low, and the whole adventure still stretched out before her. It would have been easy to give up, but she didn’t. Instead, she gritted her teeth, kept on pedalling and finished the first day. She was going to do it. The reader joins Hughes as she recounts tales from each day, ranging from descriptions of the landscape (often stunning, sometimes brutal), conversations with the generous hosts who offered her a bed for the night, and personal thoughts as she rode the rollercoaster of emotions that is part and parcel of any endurance challenge. 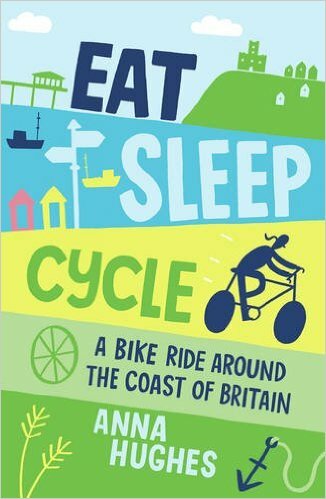 It was an easy book to pick up and put down, and perfect for me as I pedalled away on that exercise bike as it gave me something I could focus on, but without the need for deep thought. In places, I felt there could have been more description of the landscapes, but I suppose this wasn’t the real focus of the book. This was a book about the journey, in all senses of the word, not a travel book; it was an account of a challenge to complete, not a sightseeing guide. One of the main things I liked about this book was that Hughes seemed “real”. I know she is real, but what I mean is that it felt like she was cycling beside me telling her story. Her words flowed naturally and I could feel a connection with her through her prose. She was relatable and felt like a friend baring their soul as we pedalled on. Unsurprisingly, I was quite sad to finish. So if you like the idea of adventure, this book shows you that adventure can be had without having to travel too far afield. It shows us that the journey itself is often much more important than the destination. And it shows us that sometimes we have to step off the treadmill of life and take our time rather than rushing through everything. We’d all do well to remember that. You can learn more about the journey here. You can follow Hughes’ further adventures here.